The project has so far found 291 living oak trees in the grounds with a girth of at least 5m (16ft). Researcher Aljos Farjon said parts of the estate were "like stepping back into the distant wild past of our country". About 220 of the trees deemed important there are in High Park, a fragile site of special scientific interest that is currently closed to the public. The palace in Woodstock is a World Heritage Site and the birthplace of Sir Winston Churchill. 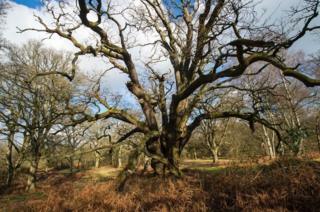 Ms Harrison-Mellor said: "Ancient and veteran trees are the fattest, knobbliest and most fascinating specimens of trees. "They were recently given better protection under the National Planning Policy Framework, but unless we know where they are, we can't campaign against their damage and destruction." She added: "We know there are thousands out there we haven't found yet - who knows, there could still be a bigger collection of ancients waiting to be discovered."